One of the first things you do when you meet someone is explain what you do. Often, not much explanation is required--"I am a nurse" is pretty straight-forward, for example. For a while, I told people, "I am physics major, and I do research in astronomy." That's pretty easy to explain. People know what physics is, and they know what astronomy is. Explaining my research was pretty straight-forward too, "Right now, I'm searching the literature for guesses of stellar ages" or later on, "I'm looking for binary stars; it's a subset of a bigger projecting looking for debris discs--dust and stuff that orbits around stars and could form planets." That stuff is really tangible. People know what stars and dust are. Overtime, I got better at explaining it quickly and simply. I'd forgotten how much tweaking it took to get it to that point; now that I'm in a new field, I have no routine for explaining what I do, and that's very strange. I'm passionate about what I do, but it's hard to convey that when I'm fumbling with how to explain my research. The shortest explanation is to say it flat out--"I'm a computational linguist, and I do research in gradable modal expressions"--but that usually leaves them with a blank stare. The structure of the sentence telling people formerly and presently what my research is is nearly identical, yet the present one leaves them dumbfounded. I can't blame them, most people have probably never heard a single content word in the latter sentence, except perhaps for "I," "research," and maybe "expressions." At this point, I try to break it down, starting with "computational linguist." In all likelihood, they've never heard of linguistics, and I lose most people here. I tell them that it's the scientific study of language, and they tell me who their favorite poet is. In fact, linguistics doesn't really have good PR. Few people have heard of the field, and without any exposure to it, it's really hard to explain what linguists do. Most often, people's concept of the study of language is in some classroom with a teacher who wants to "free their mind," not in a formal context where language is broken down rigorously and elegantly. On the other hand, physicists and astronomers have great PR. Most major projects are multi-million dollar rocket launches and magnetic loops capable of observing or replicating the beginning of time. In fact, astronomers have had excellent PR for years. From Sagan to deGrasse Tyson, charismatic figure heads have been directing the public's attention at colorful pictures for years. Linguists are stuck with, at best, Noam Chomsky, who is rarely talking about linguistics in public appearances, instead preferring to talk about the Military-Industrial Complex. It's a damn shame, as people are more interested in language than they realize. 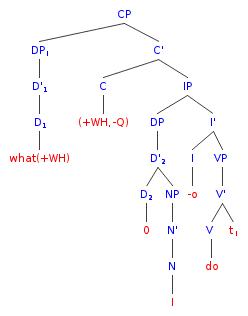 Sometimes, when you do explain what linguistics is, the concept really clicks. You can tell they get it, and one of two things happens: either they become very interested and you introduce them to the idea of voiced vs unvoiced consonants or ungrammaticality, or they become very defensive, striking a nerve with regard to the legitimacy of Black Vernacular English or the concept of generative grammar. Inevitably, people are strongly invested in their understanding of language, but few realize that they can seek a deeper understanding of something they do so systematically yet so effortlessly. So at this rate, you can see my dilemma. I've only thus far explained what a "linguist" is, and now I have to tie it to the word "computational." This one's a little easier, as I just give examples--"machine translation, Siri, getting Google to know what you meant by your search, and not just dig up the words--effectively taking all that linguists have discovered and implementing it on a computer." So if people got "linguist," then the "computational" bit is easy. This leaves me with "semantics," "gradable," and "modal" to explain. In themselves, they are not hard to explain, semantics being the trickiest, but then they have to be tied together. So usually, after a long set of explanations, I end up with a blank stare and a dead conversation, and that's never a good outcome. I'm not sure how else to explain it, beyond dodging the topic completely, or just restricting myself to linguistics. That's tough enough to convey to most folks. Maybe I could take the pretentious route and say, "ah, you wouldn't get my research, it's too deep for your plebeian brain, maybe when you're reincarnated with a better brain," but that's just rude. Perhaps I should leave it in the shallow, "I'm a linguist, and I study how people express possibilities." When they ask, "What do you mean?" I could respond with, "Well, I could explain it to you, but that would take a while," and then use that as an example of a modal expression. Maybe that's too meta, though.